We will leverage nanomaterials to enable high-throughput genome editing in any plant species. 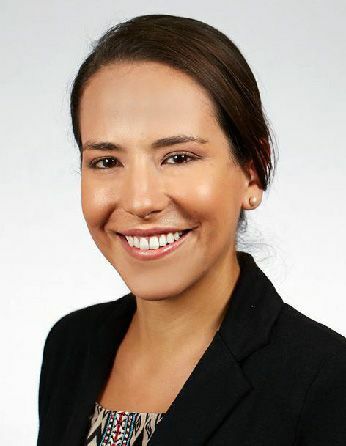 Markita Landry is an Assistant Professor in the Department of Chemical and Biomolecular Engineering at the University of California, Berkeley. The Landry lab aims to build and develop optical microscopy tools, functionalize and characterize nanomaterials, and combine these areas for in vitro and in vivo molecular detection. Read Markita’s “Meet an IGI Scientist” profile here. Genetic engineering of plants is at the core of environmental sustainability efforts, natural product synthesis of pharmaceuticals, and agricultural crop engineering to meet the needs of a growing population in a changing global climate. We must implement tools to transform agricultural practices in order to meet growing food and energy needs. Recent progress in genome-editing tool development has revolutionized researcher abilities to genetically probe and modify living systems. However, genetic engineering of mature plants and their plastids has remained a challenge owing to the numerous physical barriers that need to be crossed for mature plant genome editing. Nanomaterials hold great promise to advance our knowledge of – and toolset for – genome editing, particularly for plant science. We will (i) develop a nano- to meso-scale understanding of the mechanisms by which nanoparticle transport across the plant cell and chloroplast membranes can be accomplished. (ii) Identify nanoparticle composites that are highly efficient for plant cell internalization, and utilize said nanoparticles to deliver DNA, RNA, and Cas9-gRNA RNP to plants and calli in a species-independent manner. The physical barrier presented by the cell wall has limited the ease and throughput with which exogenous biomolecules can be delivered to plants. Current techniques suffer from host range limitations, low transformation efficiencies, toxicity, and unavoidable DNA integration into the host genome. The proposed study will systematically characterize nanomaterial transport in plants to develop tools for nanoparticle-mediated genome editing. We will create a nanoparticle platform to enable electrostatic grafting of genome engineering biomolecules, which will be leveraged to genetically transform mature plants. Our preliminary work demonstrates efficient diffusion-based plasmid DNA and small interfering RNA (siRNA) delivery into two species of mature plants with a suite of pristine and chemically functionalized high aspect ratio carbon nanomaterials. Efficient DNA delivery and strong transient protein expression is accomplished in mature Eruca sativa (arugula) leaves with covalently functionalized or pristine single-walled and multi-walled carbon nanotubes, with efficiencies comparable to agrobacterium-based transfection. We demonstrate a second nanoparticle-based strategy in which siRNA is delivered and activated in the Nicotiana benthamiana plant cell cytosol, effectively silencing a gene with 95% efficiency. Based on this preliminary data, this study is founded at the interface of nanomaterial science and plant genomics, to systematically unravel the complexity of nanomaterial interactions and transport in plants for genome editing. Broad-scale production of transgenic plants can mitigate the increasingly urgent need for sustainable and high-yielding crops. Studying nanomaterial biodistribution in plant systems, and leveraging their use to create mature plant genetic transformants, will enable a synthetic method for creating robust crops to meet our food and energy needs. Our work provides a promising tool for species-independent, targeted, and passive delivery of genetic material, without transgene integration, into plant cells for rapid and parallelizable testing of plant genotype-phenotype relationships. (Top left) For expression of a functional gene, DNA is delivered into the mature plant cell nucleus with carbon nanotubes. Separately, for silencing of a functional gene, siRNA is delivered into the plant cell cytoplasm with carbon nanotubes. 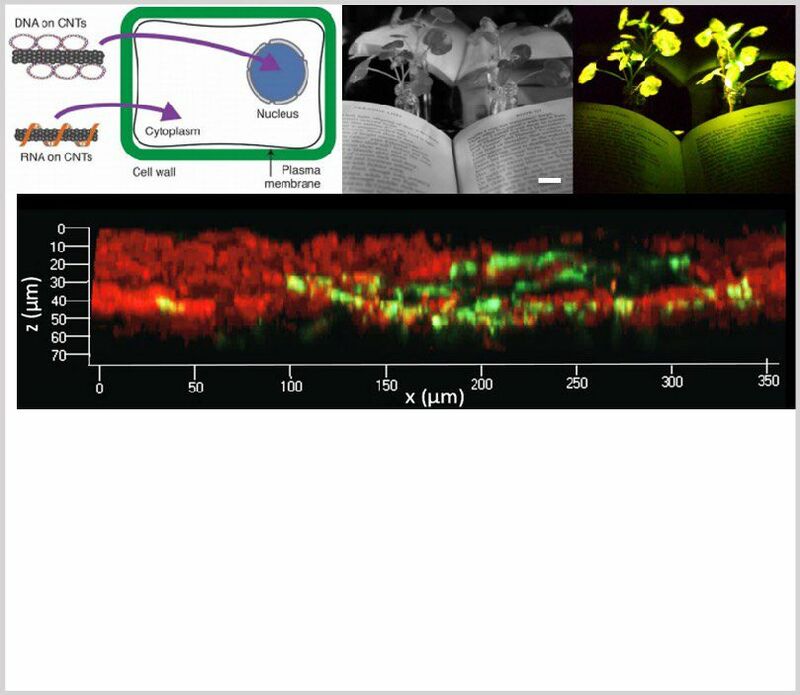 (Top right) Illumination of a book with light-emitting plants (two 3.5 week old watercress plants). (Bottom) Z-axis fluorescence profile of an arugula leaf expressing GFP after 3 days of infiltration with DNA carrying carbon nanotubes. Green: GFP fluorescence, Red: chlorophyll autofluorescence. This news was highlighted on the NPR program, "All Things Considered." Listen here.